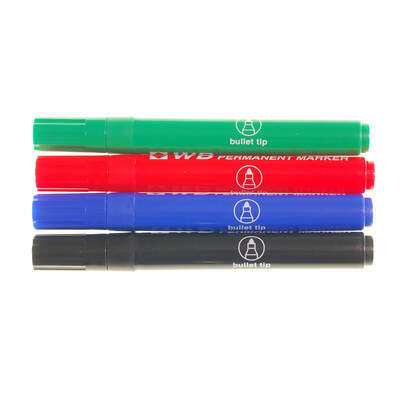 Replenish a staple item in your stationery cupboard with our Permanent Markers Assorted 4pk. Ideal for all work environments, these low odour and non-toxic marker pens have a thicker barrel for added comfort. The durable and long-wearing tips are bullet shaped, enabling the writer to create both fine and thicker lines. The ink provided is suitable for use on most surfaces from paper and card through to wood and plastics. Creating a permanent mark that will stay put for many years to come, they are also ideal for marking the clothing and bags of different students and labelling boxes for your organisational needs. Our extensive Stationery Supplies collection continues to grow to meet the needs of our customers. Alongside these permanent markers, we also have everything from everyday HB Pencils through to Correction Fluid and Colouring Pencils, so you'll be able to replenish your entire stocks right here.